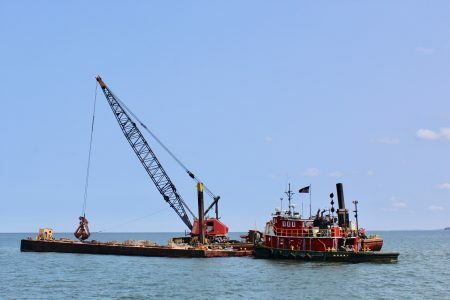 Dredging of the navigation channel into Sodus Point, N.Y. on Lake Ontario took place during July and August, 2018. The U.S. Army Corps of Engineers awarded the $16 million dredging contract to Luedke Engineering Co. of Frankfort, Mich.About 58,000 cubic yards of material was tol be dredged from the federally-designated channel. It was last dredged in 2004 but over the years has silted in. Officials said the project started July 23 and was to be completed by the end of August. The channel should have a depth of 16 feet when the dredging project is complete. Sodus is now used solely for recreational boating. Commercial shipping, primarily coal, ended in 1967. While the channel no longer needs to be deep enough to support lake freighters, the reduced depths have discouraged larger recreational boats, said Sodus Point Mayor . “Sailboats with a significant draft no longer come (into the harbor) for fear of getting stuck,” said Sodus Point Mayor Dave McDowell. He noted that this has slowed business for boat-oriented Sodus Point — a largely summer community that, in 2017, suffered significant losses of business due to high lake and bay levels. Merchants indicated business appears to have rebounded nicely in 2018, thanks to lower water levels and a hot, dry summer. Sodus Point generates about $9.5 million in economic benefits, the mayor said. . There are other benefits to the dredging. McDowell said the greater channel depth should increase the exchange of water between Lake Ontario and the bay.“Ultimately, that is expected to improve the water quality of the bay,” including decreased weed growth, he said. Dredged material is being used to address a breach between nearby Beach to the east of the channel that developed two years ago and widened in 2017 during record-high water levels on Lake Ontario. waves carrying heavy amounts of silt were crashing directly into the bay by way of the breach. The spoils from the dredging are being used to repair the breach between Charles Point and Crescent Beach. The narrow strip of land connects with a breakwall to protect the bay from sometimes turbulent lake waters. JKDrone Extra: The massive dredging project at Sodus Point, NY continues where Lake Ontario meets Sodus Bay. A Michigan-based company has been dredging the navigation channel here the last couple of weeks. Some 58,000 cubic yards of material are loaded onto a barge and off-loaded nearby. This is the first time this area has been dredged since 2004. Thanks to Vertigo Drones for the guidance in flying the Typhoon H.